Tails are wagging for The Big Give Christmas Challenge return! We are delighted to announce that we will be taking part in The Big Give Christmas Challenge 2018. Canine Partners first took part in the match-funding challenge in 2016, raising over £60,000. A year later, for the Christmas Challenge 2017, we raised over £70,000! But this year, we are aiming even higher with a total fundraising target of £90,000. The Big Give Christmas Challenge is a way for your donation to go even further, with all donations DOUBLED by Champions who have pledged to match all donations until we reach our target. Online supporters will be encouraged to help us raise the initial £45,000 which will then be matched to reach £90,000. But the clock will be ticking, as the Challenge is for a limited time only. The Challenge kicks off at 12pm on Tuesday 27 November (Giving Tuesday [ http://www.givingtuesday.org.uk/]) and will close at 12pm on Tuesday 4 December. 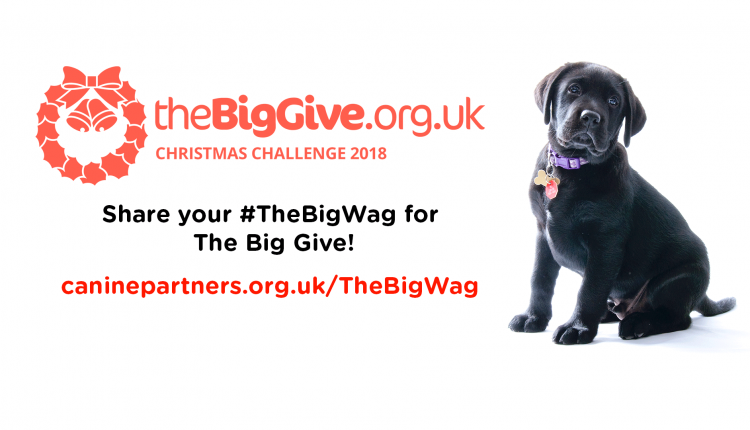 To drum up excitement for The Big Give Christmas Challenge, we are asking people to share their own #TheBigWag on social media – a video of their four-legged pal wagging their tail in anticipation! To find out how to help us spread the word, visit caninepartners.org.uk/TheBigWag. The link to donate will be available once the Challenge begins at 12pm on Tuesday 27 November.